Love is in the air. Valentine’s Day is just around the corner. Remember Valentine’s Day B.C. (before children)? It was all about you and your true love. And then along came children. 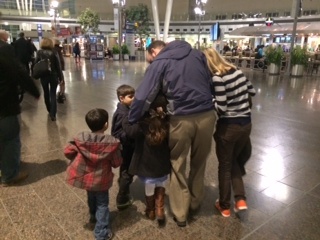 Now that we have four delightful children, Valentine’s Day has become more about the family than just about my hubs and I. Really, many reasons have factored into that. Babysitter’s are at a premium. The restaurants we like to go to only serve a “Valentine’s Meal” (way over priced) or have been booked for awhile. We opt to go out another night instead. Don’t get me wrong – my true love knows that roses are still a must on Valentine’s Day even though we spend it with the kiddos. So, here are some ideas on how to make Valentine’s Day fun for you, your true love, and your little true loves. 1. Do a themed Valentine’s meal. This year the kids really want to see the sequel to a certain spaghetti movie. I succumbed and got the DVD. Dinner will be none other than a spaghetti dinner. Dessert will be cupcakes from our local cupcake store (mile high frosting fits with the theme). Then we will cuddle up on the couch and watch the movie. 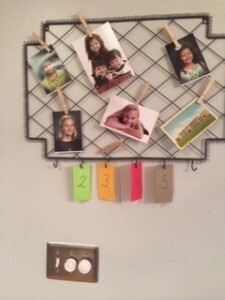 Pick a theme your kiddos love and run with it. It always makes the meal go much easier too. 2. This idea I got from my son’s preschool teacher. Help your kiddos make heart shaped mailboxes out of paper plates. You and your hubs could make one too. Then have everyone write love notes and put them in the mailboxes. You could also use decorated brown paper bags. 3. Make Valentine’s by using conversation candies. You can do this one of two ways. For the little guys, have them glue on the hearts with a glue stick onto construction paper. You could make a Valentine for your little love by using the words on the hearts. Sort of like a Valentine’s Mad Lib. 4. 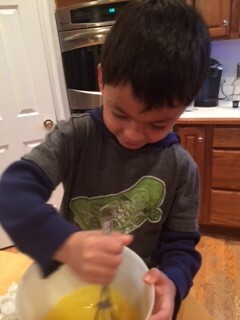 Make Valentine’s by using the kiddos hand prints. This is one that grandparents would love and could be kept. 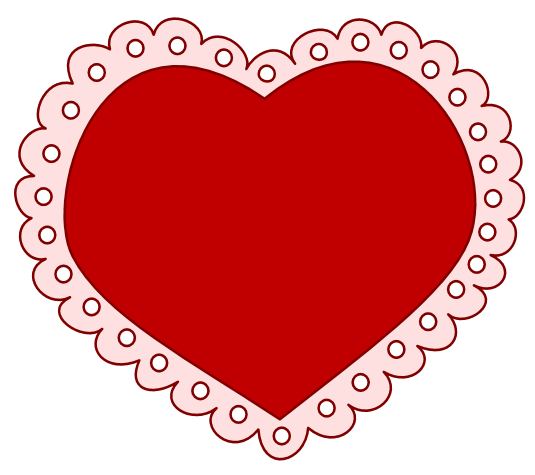 Cut out a heart out of construction paper large enough for your child’s hand. Get red and white washable paint. Paint one hand red and the other white. Gently place your child’s hand on the paper. Nothing says “Love” like a child’s hand print. 5. Make a Valentine center piece. My friend came up with this idea for a Valentine’s Day class party. Get a glass jar, fill it part full with conversation hearts, and stick in some heart flower fillers. Makes a great centerpiece and it’s edible. You can use the conversation hearts as prizes. You can make the heart shaped flower fillers by using straws and taping the hearts onto the straws. The hearts could be made by your little kiddos. 6. Have a pizza night. Make the dough into a heart shape. Have the kids help “decorate” the pizza. Enjoy a love filled dinner. There are just a plethora of ideas out there to help you with Valentine’s Day. Valentine’s Day is a good time to remind our children and ourselves who demonstrated the ultimate show of love for us – Jesus Christ. You can do this by using hearts. Cut out a red, white, and black heart. Valentine’s Day is a good time for us mom’s to reflect on what love really is. I Corinthians 13 gives a checklist for us. 1. Do I speak with love or am I sounding brass? 2. Is my faith filled and demonstrates love? 3. So my works show love to others? 6. Am I glad for other’s when they receive blessings? 8. Do I behave myself wisely? 9. Do I strive to make others look good without receiving any glory? 10. Do I get angry easily? 11. Do I look for the good in others? 12. Do I rejoice in truth? 13. Do I bear all things God gives with love? 14. Do I believe all things in His Word? 15. Do I hope in all His promises? 16. Do I endure all God sends my way? That’s a LONG and CONVICTING checklist. Yet, all those things shows God’s love to others. Do we show God’s love to our families? We try to keep our children safe in our “nest”. We bandage skinned knees, give kisses to minor bumps, and provide “boo boo bunnies” to minor bruises but we must do more. We must build trust with our children so children can then in turn trust others and God. Trust is an important part of building independence and thus dependence on God. God teaches us (parents) in His Word so many times through nature. By understanding nature it helps us to see the word pictures God shares with us through His Word. Let’s take a look at the parenting qualities of the eagle so we can better understand Deuteronomy 32:11. 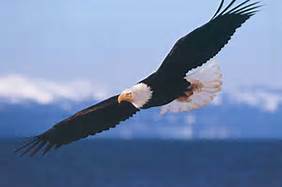 Did you know that 98% of the time one parent of an eagle pair remains on the nest with the eggs? The parent with the eggs not only provides warmth but protection. Newly hatched eaglets are soft with grayish-white down. Their wobbly legs are too weak to support their bodies and their eyes are partially opened. The only protection they have is what their parents provide. The parents take turns feeding and caring for their eaglets. The adult eagles shred pieces of meat from their prey and share with their eaglets. The female eagle gently coaxes the eaglets to take the meat from her beak while eating the leftovers herself. We too give the best to our families. How many times have you eaten the heel of a loaf of bread? At three to four weeks the eaglets are covered with a secondary coat of down. In approximately two more weeks black, juvenile feathers begin to grow. As the secondary feathers replace the down the eaglets are ready to test their wings. An eaglet takes its first flight some ten to thirteen weeks after hatching. The parents encourage the eaglet to fly by gradually limiting the dependence upon them. The parents stay close in assisting, teaching, and encouraging their eaglets. T-Time, you have to spend time with God in order to know God. Reading God’s Word and talking to Him in prayer helps you to know Him. R-Rust, is what happens when we do not spend time with God. (I showed a rusted car muffler to the children.) We become ineffective to do the job God has for us when we do not spend time with God. U-“U” can trust God. There are over 7,000 promises in the Bible. People may let you down, but God is Holy and always keeps His promises. S-Savior, God gave His Son so we might have everlasting life with Him. God provides for us in every way. T-Trust, is developed over time, by not allowing rust (not taking care of the relationship between you and God), “U” can count on God, the Savior (Jesus Christ) was God’s only begotten Son that died for you and me. God’s Word is what will last after children have left our “nest”. We need to build our nest well. Time goes quickly. We need to cherish the moments. Impart God’s Word and God’s love. Our help comes from the Lord. He has given many examples and words of instruction for us through His Word. Dad is home and all is right in the world! This past week I had to “churn the butter” a little bit more than usual to help the kids achieve good behavior. You see, Dan was on a business trip. Never mind I don’t sleep well at all when Dan is gone. Dan left on a Sunday afternoon. I knew that this could be a humdinger of a week when Sunday morning at breakfast the kids started crying that they were going to miss dad and he was still here! My kids thrive on surprises. I thrive on good behavior from the kids which makes life more enjoyable for all. Here is what I came up with. Dan was gone for five LONG days. I numbered five 3×5 cards 1-5 and put holes in the top of each. On the back of the cards I put a different fun activity for each day. My kids also like to sleep in my bed with me while Dan is gone. (This equals very poor sleeping for mom!) However, desperate times call for desperate measures. So, on the back of each card I also wrote a child’s name. I didn’t go in order by age but all random. One day there was no name and that meant that night mom was guaranteed a restful night (or at least a night with no little appendages on my head or in my back). In order for each child to participate in the fun activity, they had to have beyond good behavior for that day. If your name was on the back of the card to sleep in mommy’s bed, that child’s had to have light years beyond good behavior. At lunch, I explained the game plan for the week, told them what I expected as good behavior, and set my plan into motion. Sunday night: The kids love to go to a particular restaurant after church and get pizza. This is a rare treat! Thus, it made the cut for the first night of surprises. Thankfully, they all made the grade (I really didn’t want to cook that night anyway) and one of my kiddos was the lucky recipient of Pj’s with mom. Monday night: Well, Monday was a little more dramatic of a day. I had to get a foot x-ray (all’s fine), another child had to go to the dentist and get his tooth pulled (laughing gas and a 6 year old boy don’t mix very well), and we discovered an unexpected little visitor in our house. That night went much better. 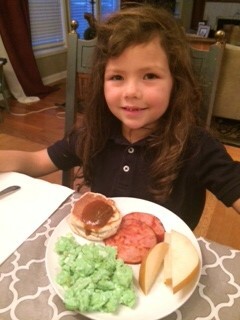 The kids love grandma doing “Green Eggs, and Ham” with them. So, guess what we had for dinner? Love eggs, green eggs not so much. However, the kids had a ball making them with grandma and we had no dinner ummm…. issues (shall we say) that night. Making green eggs and ham. Another child made the cut of Pj’s with mom. Tuesday night: Movies are usually reserved for Friday night Family night at our house. Like I said earlier, desperate times call for desperate measures. To insure no dinner time issues, I reminded them that we still had a surprise coming. Popcorn and a movie was greeted with ecstatic cheers, bean bags were gathered, and children nestled down for a fun night. Mom slept by herself. BLISS! Wednesday night: Our church does Wednesday night dinners for those who purchase a ticket. I figured tacos was a relatively good choice (health wise and good behavior wise). Taco night at church made the cut. Another child made the Pj’s with mom cut. 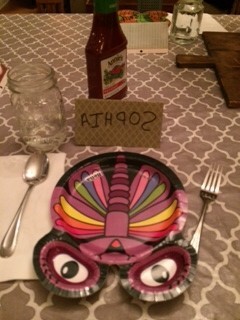 Since, they didn’t know what was going to be next, the kids were amazing during dinner. 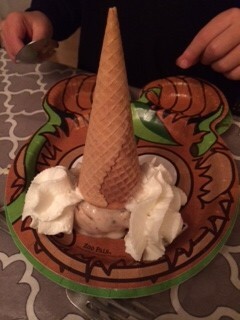 I ended with making cone head sundaes for the kids (upside down sundaes). Friday!!!!! One of my kids had a birthday and all were excited because that night dad was coming home!!! I think the opening picture says it all. Overall, a great week. Good behavior was at a premium, fighting was at a minimum, and fun was had by all. Just may have to do this again. Only this time, dad does it with us! 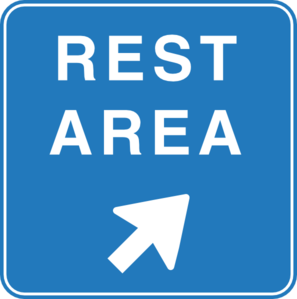 How many times have you been traveling and look on a map or use an app to see when the next “Rest Area” is located? Your children need a place to run off some energy while you just need to stretch and regroup for the miles ahead. We all need times of refreshing and regrouping. January is the month of new beginnings. I have said to my husband that this is the Year of Jubilee. You know, forget about those things that need to be forgotten. Make life simpler, move on, and prepare for the future. 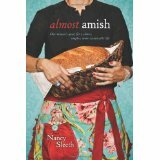 This new year’s thought all began when I met Nancy Sleeth at a Christian Writers Conference and read her book Almost Amish, one woman’s quest for a slower, simpler, more sustainable life. It is a thought provoking book, with Scripture illustrations, that provides ideas and a plan to make life simpler and restful both physically and spiritually. The chapter about “Community” is very refreshing. “According to an Amish proverb, face-to-face contact with a friend is ‘like the rainbow that is always there for you after the storm. '” Texting and emailing are nice tools but there is nothing like actually meeting with a friend. C.S. Lewis advises in Mere Christianity that “Going back can sometimes be the quickest way forward.” Going back is good yet I do enjoy electricity, grocery stores, and my iPhone. If I do not have to go back to Laura in Little House on the Prairie but can manage to embrace some of the things taught in Almost Amish I am ready, especially when I look around at the unnecessary and unused accumulated items . Giving to others, helping others, and freeing space and time to better serve family and God is a life pleasing to God. Going back to clean, purge, and evaluate needs will help in going forward. Happy New and Simpler Year! Routine is something most people thrive on. I am one of those moms that looks forward to a break from routine. I love summer breaks because there is no set routine of activities from day to day. Christmas break is the same way. We pretty much hibernate over Christmas break – partly because we are “go, go, go” during the school year. In fact, I am probably more disappointed than the kids when Christmas break is over. However, this year was different. Somehow 19 days of Christmas break was 19 days too long. Maybe it was the 33 hours of no power. 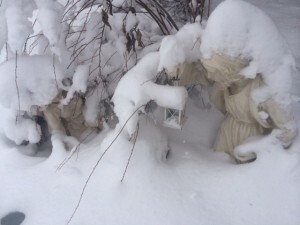 Maybe it was the extreme temperatures that forced the kids inside. Thus resulting in little bodily exercise and release from pent up energy. Maybe it was the 10 inches of snow that made it difficult to get out. Maybe it was the “I don’t know what to do” cries. Whatever it was, I was doing the happy dance when the kids went back to school last Thursday. I think we were stir crazy and quite frankly we were ready for routine again. That is until this Monday morning when the 6:00 a.m. alarm went off. Then the thought of routine was NOT so appealing. Yet, truly there is something to be said for routine. It is the beginning of a new year. It is the time of year when many people make pledges to develop certain routines. Eating healthy. Exercising. Daily Bible reading. And the list goes on and on. Why do we decide to make promises at the beginning of the year to develop new routines? Maybe it’s because we have let our established eating routine get sidelined with all the sweet treats. (Guilty as charged!) Maybe it’s because exercise became less of a priority during the holiday season due to time. Maybe it’s because we know we haven’t spent as much time in the Word as we should have this past year. Whatever the reasons, we decide to make pledges to develop new routines or improve old ones at the beginning of the year. Yet, how many of us have already failed and it is only 2 weeks into the new year. Sigh….. Here are some thing our family is doing to help with our routines or newly pledged routines. 1. Today, my mom and I joined a gym. She swims. I run. I don’t swim. She doesn’t run. Yet, I think this will work for us to get into a pattern of meeting at the gym and keeping each other accountable for exercising. BTW- the water Zumba class does sound interesting. I might just don the bathing suit and give that a whirl. 2. Grab a friend to help keep you accountable. I have one buddy for running. We both had rough patches of getting it in before the holidays. OK – rough months of getting in the running due to health and work. I have another friend that is my prayer partner and we have been for a couple of years. Proverbs 27:7 refers to friends keeping each other accountable. 3. There’s an app for that. Yep, there are some for exercising, Bible reading, eating, just about anything you want. Find one you like and use it. 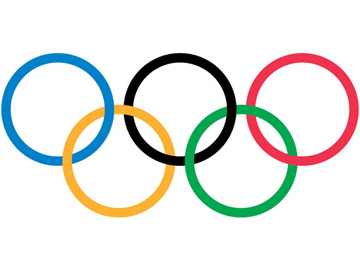 (mmmmm…..maybe future blog). I like the Bible Gateway app because there is an audio version for some of the translations. My mom and I use that for our devos especially for those really busy days. My husband uses a “Read-Through-The-Bible-In-A-Year” pamphlet. My daughter is using Streams in the Desert for Kids to help her establish a routine of daily Bible Reading. So, as we dive into this new year, take the time to write down a couple routines that you want to improve on or start for yourself as well as ones for your family. Then jot down ways to help you establish that routine whether it be a friend, a book, or an app. Start today developing routines that will help you become more and more the mom God wants you to be. 1/3 c of maple syrup and honey combined. Add cinnamon, ginger, and all spice to taste. You can also add coconut, dried fruit, nuts, pecans, etc. Preheat oven to 300 degrees. Mix all the ingredients together until well coated. Place on a cookie sheet and cook for 40 minutes stirring every 15 minutes. When done, pour the granola on wax paper and let it cool completely. Place in an airtight container. 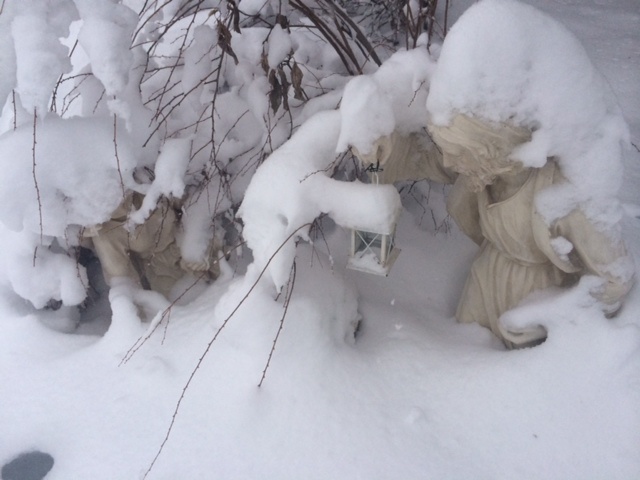 Mary, Joseph, and Baby Jesus covered in snow. It is amazing how much we rely on electrical power and how much we don’t realize it until we don’t have power. My family had that lesson brought home to us this week. Sunday afternoon, around 12:30 the lights surged on and off twice and then the power was gone. We kept hoping it would be back soon, but as the day wore on we realized that we might be sleeping near the fireplace in the living room – all seven of us. So, we started preparing for what appeared to be the inevitable – a night without power. My hubs tried to get the generator to work so that we could at least have heat in the house. No luck. The kids gathered sleeping bags, pillows, blankets, and stuffed animals – all the necessities for a warm night. Pj’s were donned and candles were gathered. The kitchen became a command station of candles, lighters, batteries, flashlights, and games. About seven rounds of dominoes was played by candlelight and a rousing game of hide-and-seek in the dark was enjoyed by the kids. The funny thing was every time one of the kids went into a room inevitably we heard, “I can’t turn the lights on”. I don’t know how many times we heard during the first two hours, “Can we watch a movie or play the Wii?” Finally, they settled and realized we had to make do without all of the things that required power. We survived. Thirty hours later the power did come on. 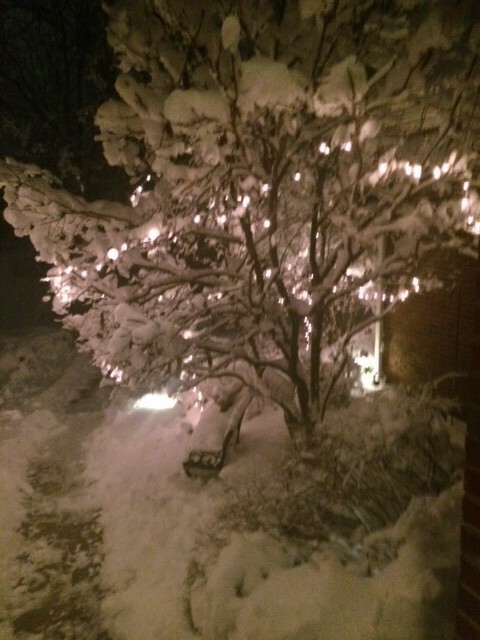 This is what 10 inches of snow looks like! I will admit we did succumb to the cold and went to a friends house to thaw out and spend the night. When your house gets down to 41 degrees and you have four layers of clothes on, two sets of gloves, hand warmers, and you can see your breath in the house – it’s time to find a warmer accommodations. But a lesson was learned. It was amazing to the kids how much we depend on power. The irony is that about a week earlier my oldest made the comment that we could get by without electrical power and that we don’t depend on it that much. She has since changed her mind. A thought occurred to me. We have an unlimited source of power as Christians – our all powerful God. Yet, how often do we tap into that source of power. In Luke 9:37-45, a father comes to Jesus with a demon possessed child and cries that even the disciples couldn’t cast out the demon. The irony, Jesus had just given the disciples the power to cast out demons (Luke 9:1). Jesus turns to them and calls them “faithless”. In other words, the disciples had power given to them by Jesus and yet didn’t tap into it. Jesus then turns and cast out the demon, heals the boy, and restores him to his father. ” And they (all that saw the miracle) were all amazed at the mighty power of God” (Luke 9:41). These same people would later be responsible for Jesus death. Lest we fault the disciples, how many times do we – I – neglect to seek Jesus power. If Jesus has the power over demons, doesn’t He have the power to take care of our needs. Idea for the week: What to do with all those Christmas cards? We gather all the Christmas cards and pictures that we receive and put them in a basket. Each night we take the card in the front of the basket, pray for that family, and stick their card in the back of the basket. This continues all year. 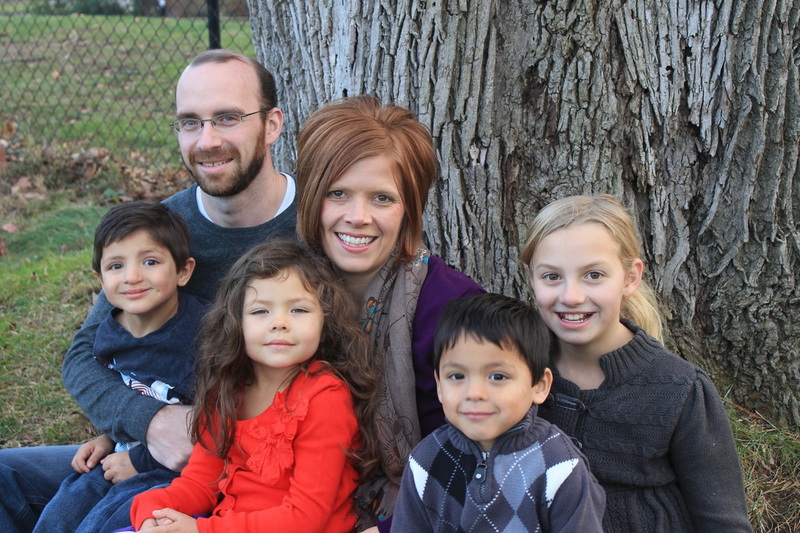 It is fun to pray for these families throughout the year.